This recipe takes the chowder up a stylish notch and makes a fantastic Saturday lunch or supper. Using a readymade puff pastry sheet is a great time-saver too. Heat the oil in a saucepan set over a medium heat. Add the bacon and leek and fry for 5 minutes, until the bacon is cooked and the leek is soft. Add the flour and cook for another 2 to 3 minutes. Gradually add the stock, followed by the milk, whisking as you go to avoid lumps from forming, then add the potatoes. Season with salt and pepper. Bring to the boil, then reduce to a gentle simmer and cook for about 10 minutes, until the potatoes are soft. Add the mixed fish and cook for a further 4 to 5 minutes, until the fish is just cooked through. Allow to cool to room temperature. 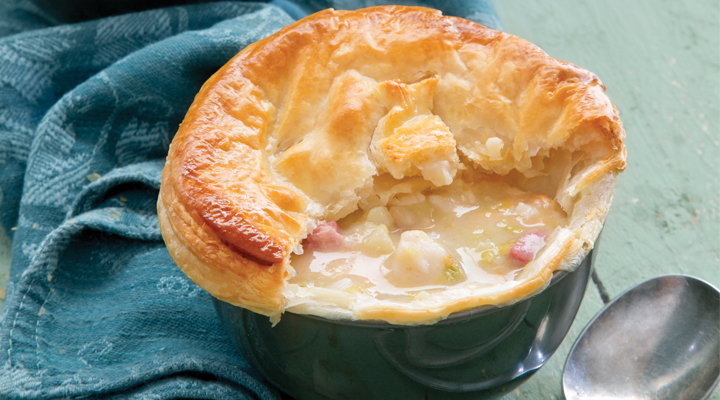 Using a saucer or small plate as a guide, cut the puff pastry into four circles about 5mm bigger than the ovenproof bowls you are going to serve the chowder in. With the pastry scraps, cut out 5mm strips to put around the rim of each bowl. Ladle the chowder into the bowls and place them on a baking tray. Brush the edge of the bowls with a little beaten egg and press the pastry strips firmly around the edge. Brush again with the egg, then put the pastry circles on top, pressing down to secure. Brush the tops with the beaten egg and pierce the centre with a sharp knife to let the steam escape. Bake in the oven for 15 to 20 minutes, until the pastry is risen and golden brown. Serve immediately.